Dielingen Parish Baptism and Marriage records are now available. Like the Wehdem records, these are index files that offer basic information, to aide your researching. Go to the Dielingen tab to find them on the Vital Records page. This is a genealogy site specific to the Community (Gemeinde) of Stemwede in Westphalia, Germany, which is part of Kreis Minden-Lübbecke and the State (Land) of North Rhine Westphalia (NRW GenWeb site). Stemwede is in central Germany, between Hannover and Osnabrück, not far from the Dümmer See. 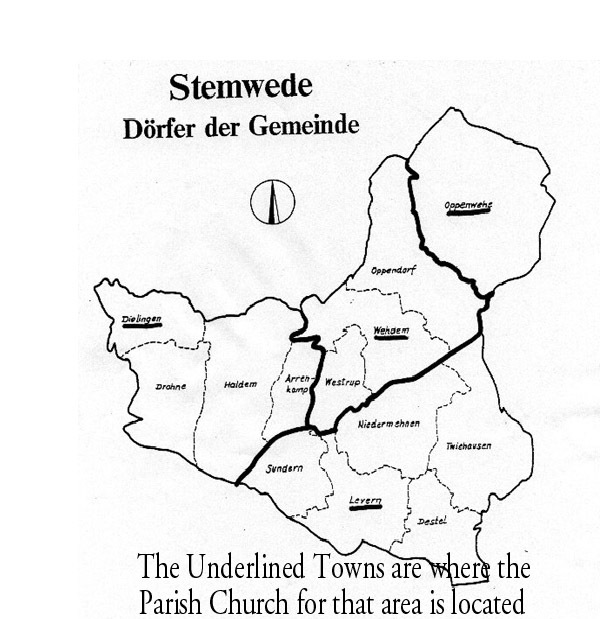 Stemwede is relatively new name for the area, becoming a municipality in 1973 when the villages in the parishes of Levern, Wehdem, Oppenwehe and Dielingen were combined together. Wilhelm Niermann, a local researcher in Wehdem has prepared a brief timeline for the area and explanation about some of the local history that affected house "addresses". This site is divided into the church parishes within Stemwede. This site continues to develop with help from those researching the different parishes of Stemwede and the surrounding areas. If you have information you would like to see added to the site, please drop us a note. We will add information as we are able to do so. Please also look at our links to other sites as you find more information at those sites. Dies ist eine Genealogie-Seite für die Gemeinde Stemwede, Kreis Minden-Lübbecke, Nordrhein-Westfalen. Es ist in die einzelnen Kirchspiele getrennt. Gibt es etwas, das sie nicht finden können? Bitte schreiben sie uns, vielleicht können wir helfen. Klicken sie auch die anderen Positionen an, dort können sie vielleicht noch weitere Informationen finden. Wilhelm Niermann's Emigrant Database for Stemwede is now available here! This document has an exhaustive listing of people that emigrated away from Stemwede. Church Parishes & their Records: Baptism, Marriage and Death records were traditionally kept by the church until the early 1900s, when the government became the central record keeper. The church books still reside in the churches but are archived for safekeeping and cannot be accessed directly. Instead, microfilm records are available in the regional church office in Bielefeld and also in the city of Lübbecke. If you plan to visit the area and want to look at the books, you will need to go to Bielefeld or Lübbecke and should make arrangements in advance. Contact information for the office in Lübbecke: Kirchenkreis Lübbecke, Kreiskirchenamt, Geistwall 32, 32312 Lübbecke. Telephone: 05741-2700-0. These records are the same as can be accessed in the Mormon Church Libraries in the US. Map Room: A collection of maps from the area, including maps of the villages, showing the locations of homes with the old homestead numbers, which are referenced in the church records. Reading & Understanding German Church Record Entries: Examples of a baptism and marriage record and what they mean. The information in these resources are pertinent to the Protestant population since they are derived from the church records. For Jewish information, you may look at the website(s) administered by the Jewish Genealogical Society, http://www.jewishgen.org/ , which are searchable by both surname and place name, and which give links to researchers doing work on families and places throughout the world. Niedermehnen (in the Levern Parish area) has a Jewish Cemetery and prior to World War II, had a Jewish Street in town, plus a Synagogue. However, I am not aware of any particular information to research these items.